Nevada Governor Brian Sandoval (R) isn’t very thankful for his state’s attorney general this Thanksgiving. The governor in his second term expressed his worries this week over the state’s leading legal advisor publicly supporting the Restoration of America’s Wire Act (RAWA), a bill that would effectively outlaw all forms of online gambling. A letter has been circulating among the country’s 50 state attorney generals that calls for support of RAWA and the restoration of the Wire Act to its pre-2011 interpretation. Four years ago, the Department of Justice opined that the federal law referred only to sports betting and not online gambling. 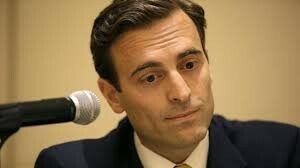 Appearing on the PBS program “Ralston Reports,” Nevada Attorney General Adam Laxalt said he plans to sign the letter and go against the current law in the state in which he administers. RAWA is largely believed to be the contrivance of Las Vegas billionaire Sheldon Adelson, a man worth dozens of billions who is using his political clout in Washington, DC, to persuade, or perhaps pressure, politicians into supporting the ban. No state is more gaming-friendly than Nevada, which is why Laxalt’s position surprised many including the Silver State’s most powerful elite. Sandoval didn’t waste a minute, the governor releasing a statement to “Ralston Reports” just hours after Laxalt’s revelation went live. Sandoval’s position is presumably more of a principled stance than one being utilized for political gain. Internet gaming in Nevada is limited to online poker, and revenues have become so trivial that the state’s gaming commission stopped releasing financial statistics for the market last February. Few things in Congress seem to be bipartisan, but RAWA is certainly an exception. The bill divides members of Congress, state lawmakers, and legal experts. Determining if online poker is a state right or federal responsibility is no simple query to solve. Laxalt’s support of RAWA against Sandoval’s opposition only stresses that fact. Both are Republicans and elected leaders, and while members of the same political party often hang together on controversial matters, these two couldn’t be further apart. In many states, the issue of Internet gambling might be rather insignificant, but in Nevada, gaming isn’t just a vice industry but a way of life. Tourism and gaming is the largest economic contributor in Nevada, the industry employing some 400,000 people and producing over $11 billion in annual revenues. “The gaming industry is changing and in order for Nevada’s businesses to maintain a competitive edge internationally, we must enact policies that allow the industry to meet the demands of a younger, more technologically engaged gamer,” Sandoval exclaimed.